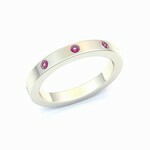 Birthstone rings come in all shapes and sizes and are very versatile. They look lovely all on their own and fabulous when worn in multiples, combined with other stackable rings that you mix and match in any combination that strikes your fancy. 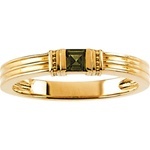 Birthstone and Stacking Ring Ideas: Give them as beautiful mother's or grandmother's rings that represent the birth or adoption of a very special child. 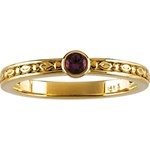 Select birthstone stackables for yourself and your sweetie. Choose them as romantic, one-of-a-kind wedding rings. Select several words of love or inspiration and stack them for a message that has personal meaning for you. If you wish, you can mix the metal colors - platinum, gold (yellow, white, and rose), sterling silver or palladium - for a dramatic look. Each Sorella ring is custom made-to-order with the personalization laid out individually for the most pleasing presentation. Read more about Sorella's collection of Personalized Mothers Jewelry.